Or are there really only two options? One of the scriptures that popped into my head while thinking about this situation is from the Sermon on the Mount. Specifically Matthew 5:38-42. In the book “Engaging the Powers” Walter Wink has an interesting interpretation of this passage in which he argues that each one of these things is actually a creative way to find a third way of creative non-violent resistance. I was most drawn to his interpretation of the part about giving your cloak as well. Wink says that if someone became naked in the Biblical culture that the shame rested not on the naked person, but rather on the person who made them naked. Therefore, if someone is suing you to take the clothes off of your back, give them all of your clothes and walk out of the courtroom naked with your head held high. In a situation where the only two apparent options are to fight or be victimized, Jesus presents a third way that resists the abuse and places the shame back on the abuser, all while complying with the letter of the law. This act would not be disobeying the command of the TSA but rather it would be going the ‘second mile’, if you will. While on one hand it is submitting to the invasiveness of the screenings it is also doing it in such a way that takes control and power back in the situation. 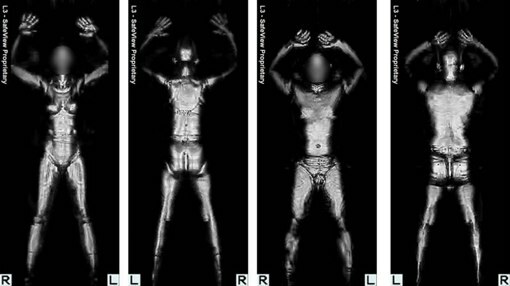 And I would also venture to say that if such an act were done in front of all of the other passengers waiting in line, it would expose the true invasiveness of the procedure and thus place the ultimate shame on the TSA, not on the individual. The Holy Bible : New Revised Standard Version. 1989 (Mt 5:38-42). Nashville: Thomas Nelson Publishers.